Today we started the tree planting agroforestry project on the edge of the Natural Reserve on the farm Fazenda Almada. During the next two weeks we will be busy removing old grass cover, preparing the soil by overturning the earth, which makes the humous purely organic, and finally plant native trees from the Mata Atlantica rainforest. To build perfect conditions for the little plants to grow strong, we use the special agroforestry technique. Basically, this means that we use biomass as fertilizer, and plant the jungle giants together with smaller crops such as pineapple and banana. For this, the agroforestry expert Isabelle explained to us the biogeochemic cycles. For instance, pineapple takes out acidity from the ground, the roots of the local Manioc loosen the soil and certain beans balance nitrogen. This way, we perfectly combine environmental protection and small-scale agricultural production. Even though we get up at six in the morning, we are all in high spirits and excited about the project. Everybody involved hopes that this is not just a two week planting project that stops once we leave. We intend to build a sustainable process to recover some of the ancient forest, which used to be the continent’s second largest. We hope that this is the start of a pilot project that eventually creates many more hectares of virgin rainforest. We are very happy that the owners passionately support tree planting and restoring land that used to be degraded by cattle. As a great start, in the morning we had visitors from the local environmental organization “Floresta Viva” who taught us many things about the wonders of the forest. We learnt about the value of the ecosystem. We walked through the forest and Selho and Paolo explained us how to secure the rich genetic material. 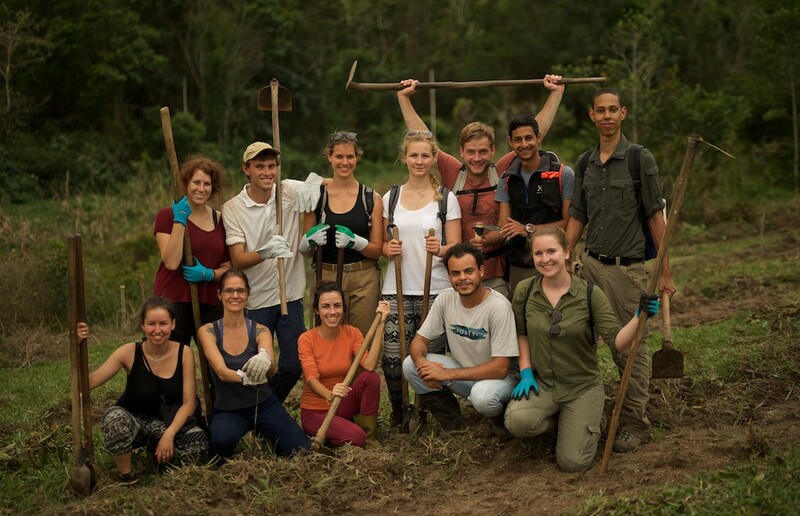 For our project, they had helped us to recover native tree seedlings. With long cutting poles they had identified the species and marked the trees to ensure the biggest diversity. It was really surprising when they told us one hectare of Mata Atlantica contains up to 450 different (!) tree species. This makes the rainforest even more biodiverse than its big brother Amazon.